A snow plant near Yosemite NP, CA. On a recent trip to Yosemite, I was was so curious about a red thing that I saw sticking out of the pine-needle covered ground as we drove through the forest to our camping spot. Actually, at first I thought it was a piece of garbage or something that was lying on the ground. But then I saw another red thing a few minutes later, and this time I was prepared to look at it more closely as I drove past. It was so strange. 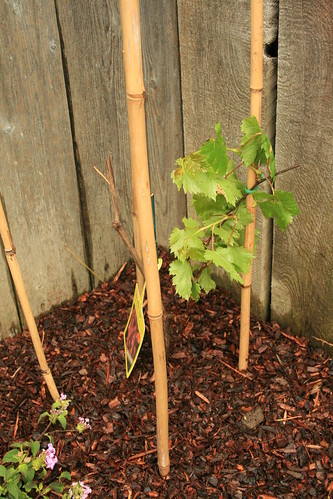 I thought I just saw a red asparagus pushing its way out of the ground! Then I thought, maybe it was a mushroom!? But it didn't look like one because it was more stalky. Of course, my curiosity was building and soon I was actively looking out the window along the ground to see if I could spot another one. Another picture of a snow plant near Yosemite NP, CA. When I finally saw another one, I screamed to pull over on the side of the road so I could get a closer look at what it was! 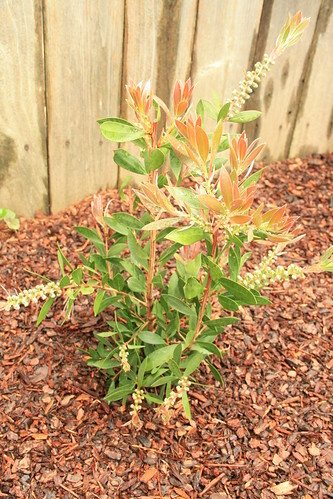 To my surprise, it actually was a red asparagus looking thing, and it was just popping out from the ground, in a small bunch, but pretty isolated. I couldn't resist, I had to poke it to see what it felt like and it was pretty firm, also like asparagus. WTF was it? We took some pictures, and yesterday I got a chance to 'google' it. 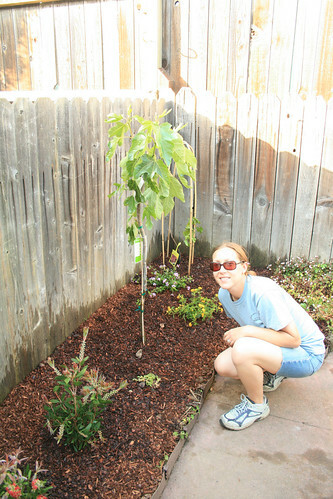 What I typed into the search bar was "strange red sprout spring near Yosemite" and I actually got some search results that showed a picture of the same red thing I saw. 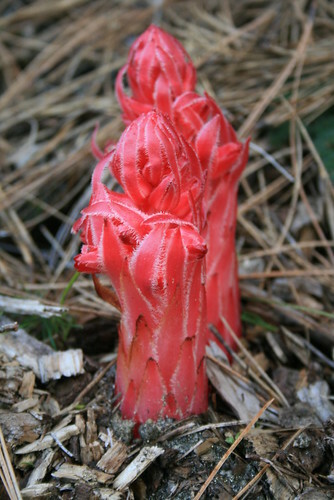 What I learned is that the strange red asparagus thing is called a Snow Plant, named because it pops out of the pine-needle and snow covered ground in the spring, and it only grows in a couple western states in the mountains. The place it is most found is in the Sierra Nevadas in California, and that's exactly where I kept seeing it (while I was visiting Yosemite with my mom and dad). It is a fungus flower. It doesn't need photosynthesis to live because it takes its nutrients from a network of fungus that attaches to the roots of pine trees. 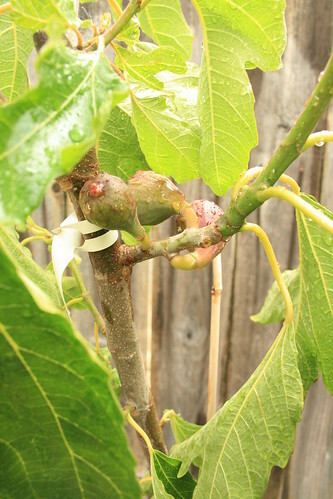 In exchange for nutrients, the fungus fixes nitrogen into the soil for the tree. 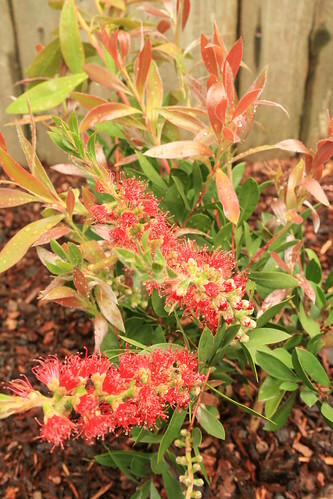 The ones I saw were just sprouting, about 3-6 inches high, but they can grow about a foot high and bell-shaped red 'flowers' bloom all along the asparagus stalk. Once it gets big, it doesn't look like an asparagus anymore. 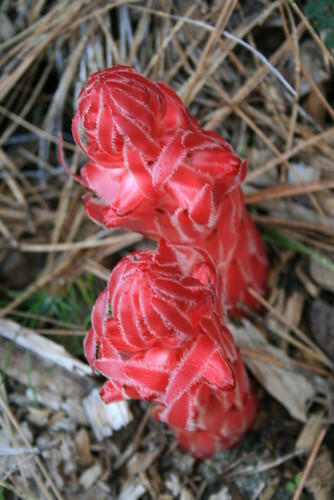 The US Forest Service has a nice description of the snow plant on their website here. Looking for something interesting to do while it was all foggy this morning, my mom and I went on a short walk around Hayward to look at one of the best examples of creep along the Hayward fault at the intersection of Rose and Prospect St. The Hayward fault is one of a few faults that separate the Pacific plate from the North American plate and it runs along the east side of the San Francisco Bay along the base of the hills. The San Andreas fault is one of the more famous faults that also is part of the fault system that marks the separation of the two plates. The Hayward fault has been responsible for large earthquakes in the past, rivaling those caused by the San Andreas, and it has been deemed as more dangerous than the San Andreas fault by seismologists in the Bay Area because it has a higher chance of rupture. We actually live less than a mile away from it! Isn't that scary? It runs right underneath the Mormon Temple up the hill from our place. Sidewalk shifted at Rose and Prospect St in Hayward, CA. Anyways, at Rose and Prospect St, the Hayward fault runs right under your feet. The sidewalks and asphalt on the road there has been repaired many times due to the constant shifting of the earth underneath it, but one corner has remained untouched since the late 1960s when the concrete was poured. We walked over to that corner to see what the creep did to the sidewalk over the past 40-ish years. 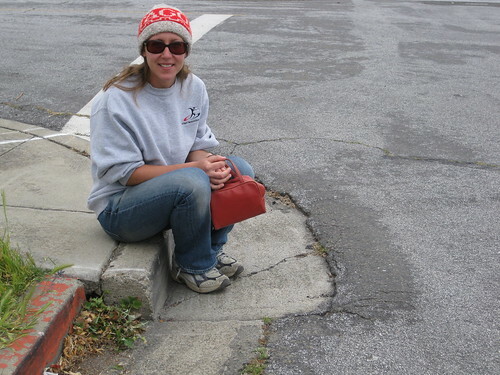 Sitting on the North American plate Rose and Prospect St in Hayward, CA. As you can see, the corner that sits on the North American plate has slid past the section of the curb that sits on the Pacific plate. When the concrete was poured, the sidewalk was even with the curb! The amount of creep that you can see on the curb is much smaller than the amount of sliding that the actual plates are doing, or want to slide past each other. Therefore, stress is building up and eventually, once the strength of the rock is exceeded, the fault will slip and cause a major earthquake. If you don't believe me, check this page out. 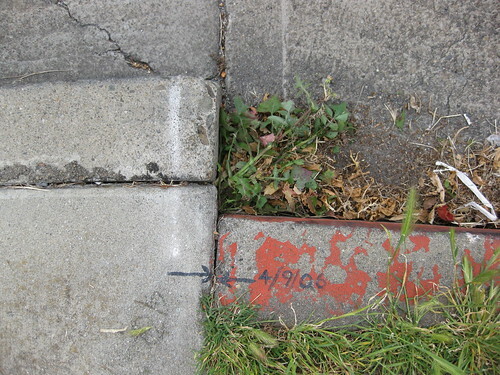 It shows pictures of the curb taken roughly every 10 years since 1971. You can see how it moved over time! Somebody painted two black arrows in the spring of 2006 which were touching, but now you can see they have been shifted by a few millimeters since then. Whats crazy is that there are really nice houses built right next to the fault! Who would want to live there!? I am now done with my master's. Today was a big day! I gave my master's presentation and got my master's thesis signed by my committee, which was two professors from Berkeley (one from the M.E. dept and one from the E.P.S. dept). I also printed my thesis on special archival paper and got it bound so that it can be placed on the shelf at the library! 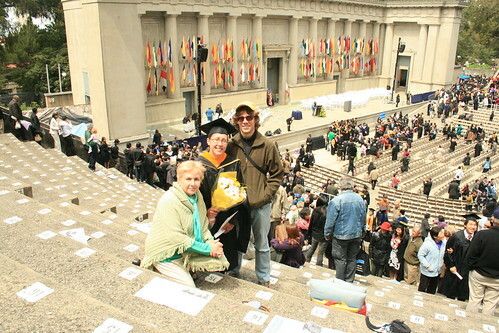 The only thing left now is to walk across the stage on Sunday May 16th! Yay! What's next? A summer full of research and a fair share of fun (maybe I should really say a summer full of fun and a fair share of research), a week-long conference in Maine, and then back to school again, this time in a new department for a PhD. 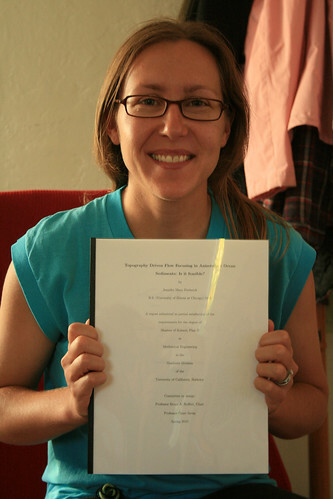 Here's a picture of me with my bound copy of my thesis. I look happy but soooooo exhuasted! Holding up my bound copy of my master's thesis.